ABR Fall Fest 2016 - Wins 3 Blues! Manchester is throwing beautiful offspring. Dark Fawn when bred to fawn, True Black when bred to black and Rose Grey when bred to Rose Grey!! Manny is showing us he is a great producer of black! He threw 5 black offspring in 2016! Manchester has the gorgeous dark brown fleece with black points and with his background from .38 Special and NeverSummer's Ladysmith, he is sure to produce incredible color of brown, black or grey. His fleece is dense and bright with wonderful handle, bundling and definition. Awesome zipper crimp style! Manchester is a very big boned male and has incredible presence and conformation. As he matures he is just getting better and better. Manchester's 2014 blanket shear weight is 6# of gorgeous fleece! WOW!! *this fleece won 1st and RC at the 2015 GWAS level 3 fleece show* Manchester's 2015 fleece took a 2nd place in class at 2015 AOA Nationals at the age of 55 months! The MAN has it! 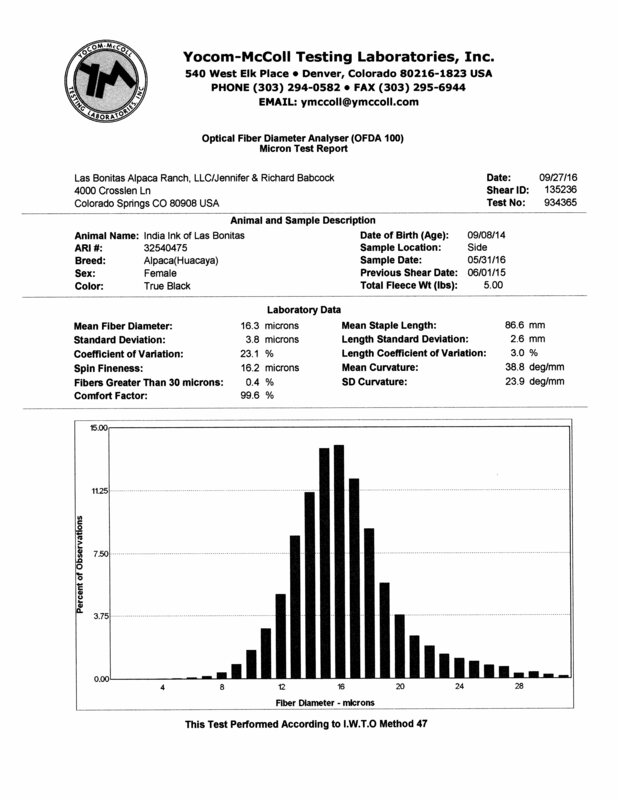 Manchester's juvenile histogram is AFD 16.3, SD 3.6, CV 22.0 and %>30 0.05 Awesome, YES! 2012 histogram is AFD 19.0, SD 4.0, CV 21.1 and %>30 1.5% (sheared 5/8/12)- SOLD to BACK 40! 2013 histogram is AFD 17.8, SD 4.0, CV 22.2 and %>30 1.1 (sheared 6/1/13)- 1st place Fleece show at FallFest 2013! Manchester's offspring are looking great! As was our intention, he covered several colors of dams so that we can prove out what he will throw. He has thrown rose grey, true black, fawns and browns. Our observation at this time is that he throws a shade or two darker than the dam. Manchester' daughter PJA's Mariah claimed a Reserve Color Brown Female banner at GWAS 2016! 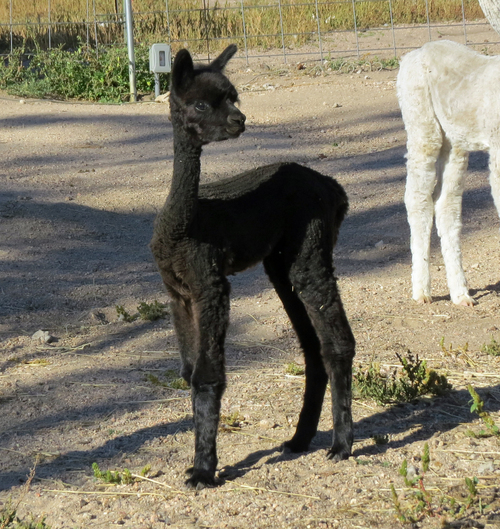 Jenna Rosita is the dark silver grey daughter of the exceptional true black Sunny Mesa’s Pepperdyne, a male who consistently produces Champion and show winning progeny that exhibit phenomenally bright, high frequency, advanced character fleeces with incredible coverage. Jenna is no exception, combining correct conformation, very upright stance and pretty head with incredibly soft, fine fleece that provides marvelous coverage. Las Bonitas’ Jenna Rosita is a carbon copy of her dam, Rose - a true black daughter of Axtion Jaxon. Both Jenna and Rose have the sweetest, almost identical white markings on their faces. Jenna one ups her momma though, with four white socks. Jenna's impressive genetics blends Alianza heritage (known for imparting lasting fineness) through her full Peruvian grand sire, Axtion Jaxon with the champion, dark rose grey background of her other grand sire, Royal Peruvian Challenger. Jenna delivered a beautiful true black female, India Ink, sired by dark brown .38 Special son, NeverSummer's Manchester who boasts a phenomenal 2013 histogram: AFD 17.8, SD 4.0, CV 22.2 and %>30 1.1 (sheared 6/1/13). India Ink was awarded 3 blue ribbons at 2016 ABR Fall Festival in halter, walking fleece, and the fleece show. 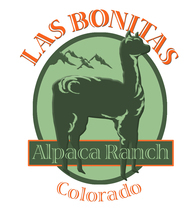 Las Bonitas' Jenna Rosita will be a wonderful addition to your herd as a foundation female, ensuring rich color, and the ability to create a cria that capitalizes on the best conformational and fleece qualities of her service sire. She is available with a breeding to any wholly owned Las Bonitas male. Fleece samples available upon request. India Ink is now a Reserve Color Champion, with two more 1st place wins, in fleece AND halter! India Ink is a stylish young female who has scooped up blue ribbons in all her classes since July, and the judges are just raving about her fabulous fleece with comments about her excellent character and density, her lack of guard hair, exceptionally soft handling fleece, and her beautiful crimp style.India's 2016 histogram numbers are incredible - just look at these numbers: AFD-16.3/SD-3.8/CV-23.1. Her spin factor is 16.2 with a comfort factor of 99.6%! India Ink began life as true black, but is quickly turning dark silver gray; she is sporting a beautiful grey neck, and has grey throughout her blanket. 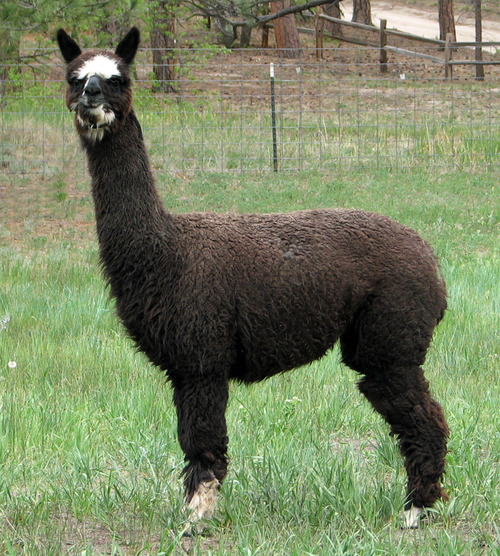 Her dam, Jenna Rosita, was born true black, but was silver grey by her 2-year shearing. India Ink is genetically loaded with grey. So we are happy and not surprised by her changing fleece color. Her maternal great grand sire was a top dark rose grey male, Royal Peruvian Challenger, and her sire, Neversummer's Manchester, is an Aussie .38 Special son. 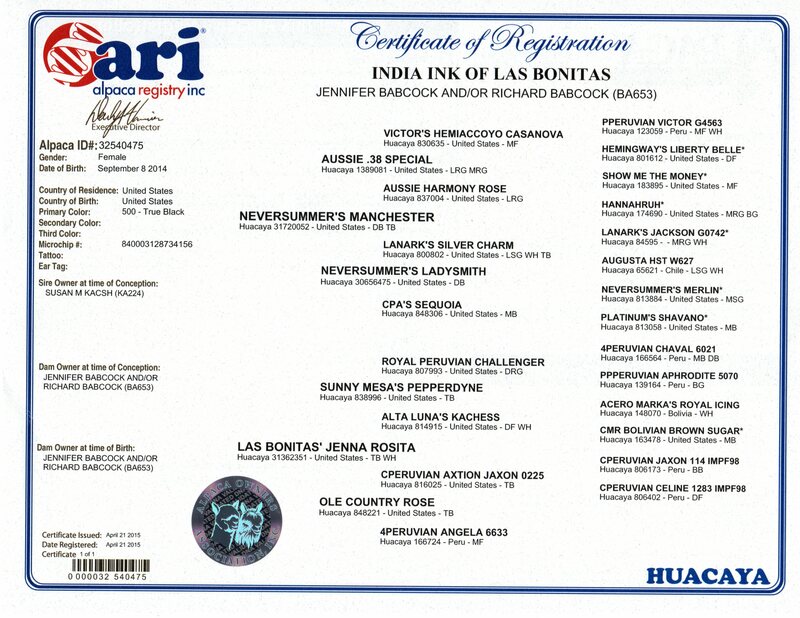 India gave birth to a gorgeous classic rose gray female sired rose gray 7X Champion EON Ambrose of Milan in June 2018! She's all that with lovely conformation, and masses of dense, curly fleece. She's a doll! Please contact Jennifer for fleece samples and additional information. - 2017 MOPACA Invitational, Fleece. 19/20 for Fineness and Handle! Judge Wade Gease said she had, "Serious hand! (And) Uniform fineness." - 2016 ABR Fall Festival, Fleece. Judge Sharon Loner enthused, " Guard hair hard to find! Very soft for such a dark color. Beautiful crimp style!" - 2016 GWAS, Fleece. 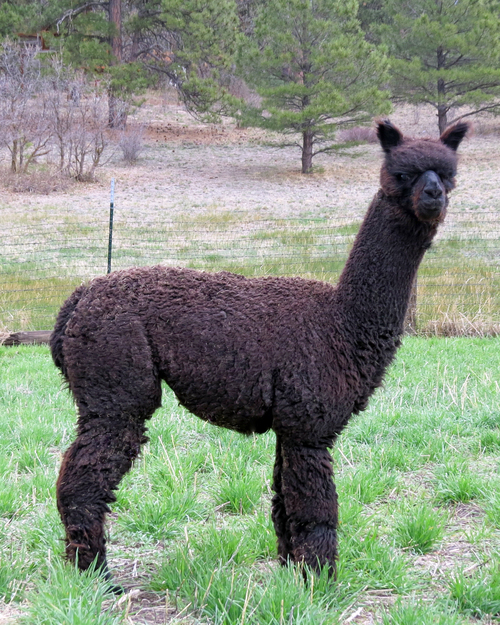 Judge Diane Timmerman loved India's fleece, saying, "Excellent character and density!" - 2015 AOA National Fleece Show. 4th of 11.